Era un día soleado en Los Ángeles. Esa calidez, sin embargo, no era tan placentera como la amigable atmósfera que se respiraba en FRAGments. La perfumista Maggie Mahboubian (Parfums Lalun) lo imaginó y trajo a la vida el año pasado como un “evento curado del perfume-como- arte”. Ese muy difuso límite (si es que algo así existe) entre Perfumería y Arte es su rasgo distintivo. Asistir a su 2da edición anual, el 7 de Junio en la galería de arte Skinny Studio, se sintió como visitar a un viejo amigo. La puerta estaba abierta de par en par y cualquiera era libre de entrar y salir cuando quisiera. 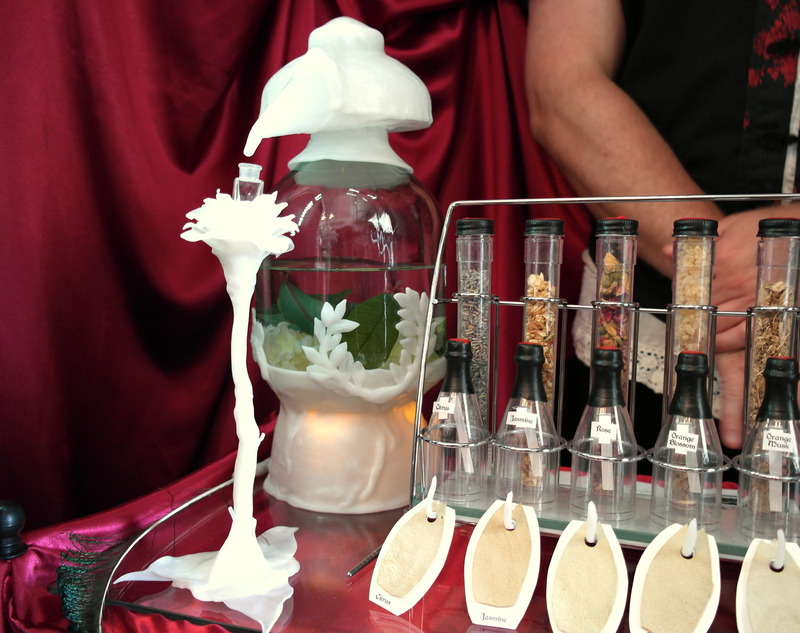 La gente estaba sonriendo, bebiendo tragos perfumados, olía fragancias y conversaba en todos los recovecos del lugar; los perfumistas y artistas compartían sus creaciones, no sólo con los visitantes sino también con sus colegas del evento. La Dra. y perfumista (Olympic Orchids) Ellen Covey comenzó la jornada dando una disertación sobre cómo funciona nuestro sistema olfativo, llamada “Scent Perception”. No existe una forma “correcta” de percibir los olores porque esa percepción está determinada por nuestros recuerdos personales y experiencias olfativas previas. Los presentes se mostraron fascinados con estos hechos e hicieron varias preguntas al final de la charla. Luego tuve la oportunidad de conocer a Iris Moore. Es una artista que experimenta con el sentido del olfato; su muestra “Addam” fue acerca del proceso de crear una fragancia a partir de una tintura de cabra. También disfruté de conversar con otro artista, Daniel Krasofski. 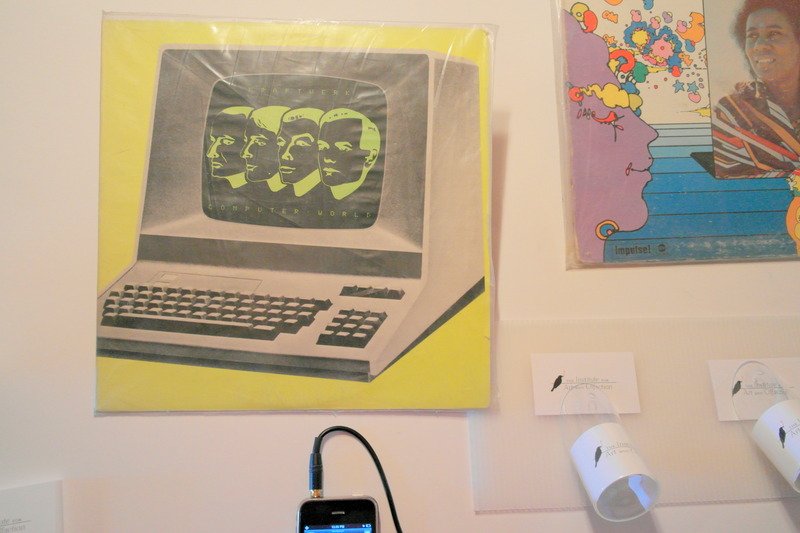 Hizo una instalación (de la cual él mismo fue parte) emulando un cuadro renacentista. Su obra constaba de presentar aquellos ingredientes utilizados en los perfumes y guantes de cuero de Catalina de Médicis. El Institute for Art and Olfaction (IAO) también estuvo presente. Saskia Wilson-Brown (fundadora) y Ashley Eden Kessler (perfumista) me invitaron a oler “Accident”. Es un relato olfativo de una escena casi cinematográfica: una mujer saliendo de su auto luego de un choque. El perfume huele a gasolina, maquillaje, neumáticos quemados y perfume. La fragancia y su botella fue una colaboración entre el artista Austin Young y el perfumista Brent Leonesio (Smell Bent). En el “front desk” de FRAGments estaba la exhibición “Smell Me” -autoría de la artista Martynka Wawrzyniak. 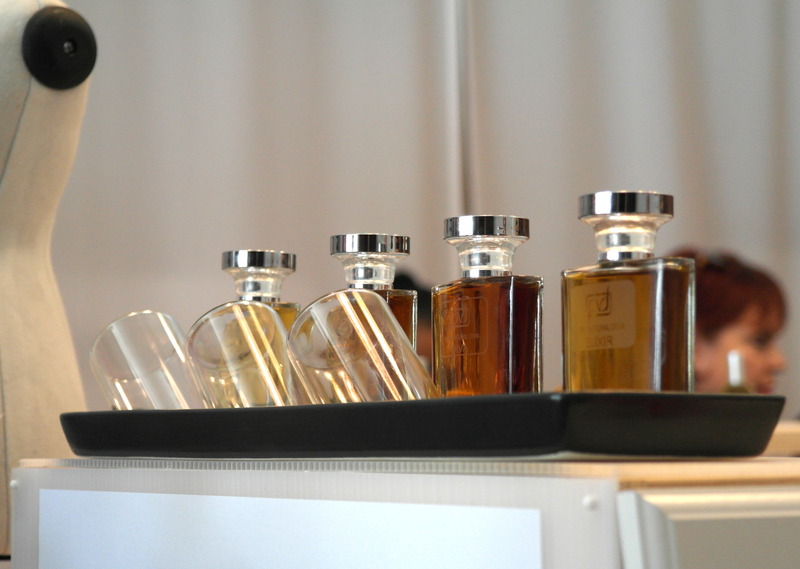 Con ingredientes sintéticos (y la colaboración del perfumista de Givaudan, Yann Vasnier) se presentaron reconstrucciones de aromas corporales. El diseño de las botellas es increíble. Y contiguo a “Smell Me” estaba “Touch Me”, una instalación táctil de Maggie Mahboubian, quien también presentó una nueva versión de mi Lalun favorito: Phenomene Verte II. 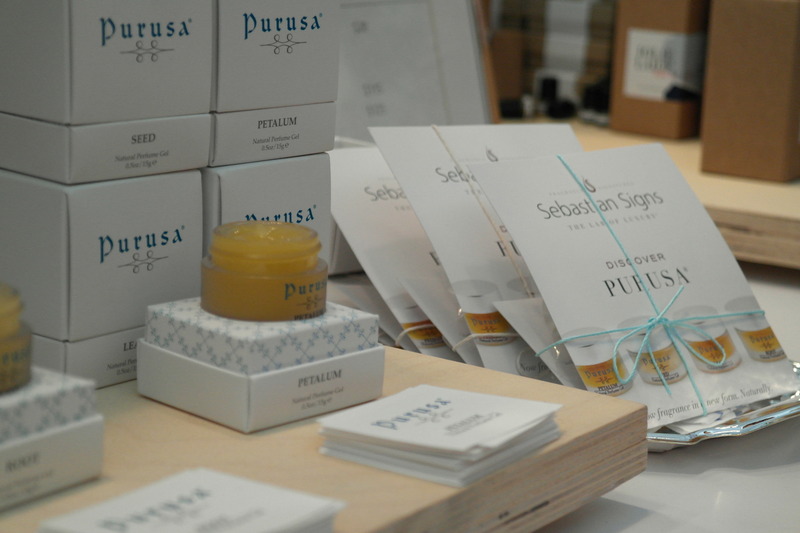 Finalmente pude probar las creaciones de Tania Reuben (Pure Natural Diva Botanicals), Dawn Spencer-Hurwitz (DSH Perfumes) y Amber Jobin (Aether Arts Perfume) así com también tuve la chance de testear sobre la piel la colección Purusa de Sebastian Signs. Sherri Sebastian -su creadora- me comentó acerca de sus innovaciones en base al uso de aceite de argan en perfumes en gel. 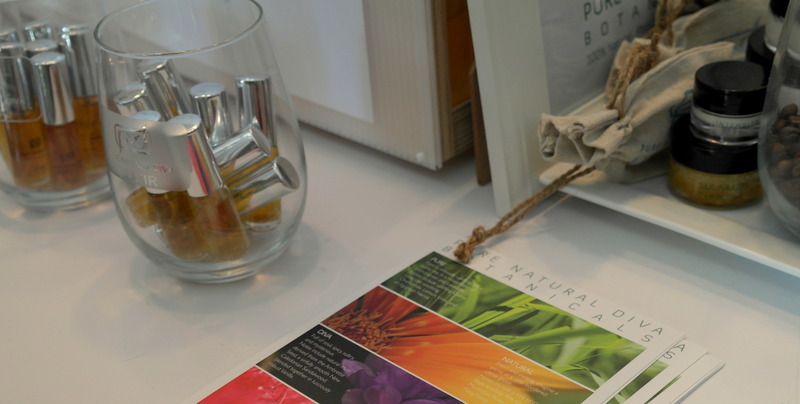 También Irina Adam (Phoenix Botanicals) me presentó su colección y disfruté enormemente las historias que inspiraron sus perfumes. 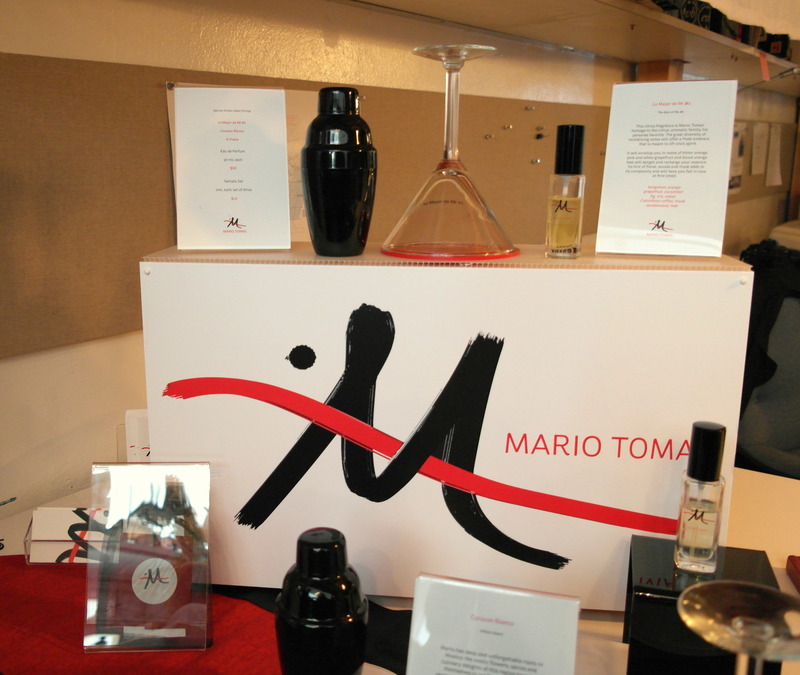 Fue estupendo encontrarme y charlar cordialmente como siempre con perfumistas ya conocidos: no sólo con Maggie y Ellen sino también con Paul Kiler (PK Perfumes), Lisa Fong (Artemisia Natural Perfume), Mario T. Gomez (Mario Tomas) y Heather Kaufman (Jolie Laide) quienes también estaban allí formando parte y exhibiendo sus respectivas y más flamantes composiciones. Realmente ha sido un placer enorme el haber podido asistir. Estamos muy agradecidas por haber sido invitadas a este evento colectivo, perfumístico y artístico. Nota bene: Por razones de espacio, no pudimos subir todas las fotos aquí, así que los invitamos a visitar el álbum completo dedicado a FRAGments 2014 en nuestra página de Facebook. 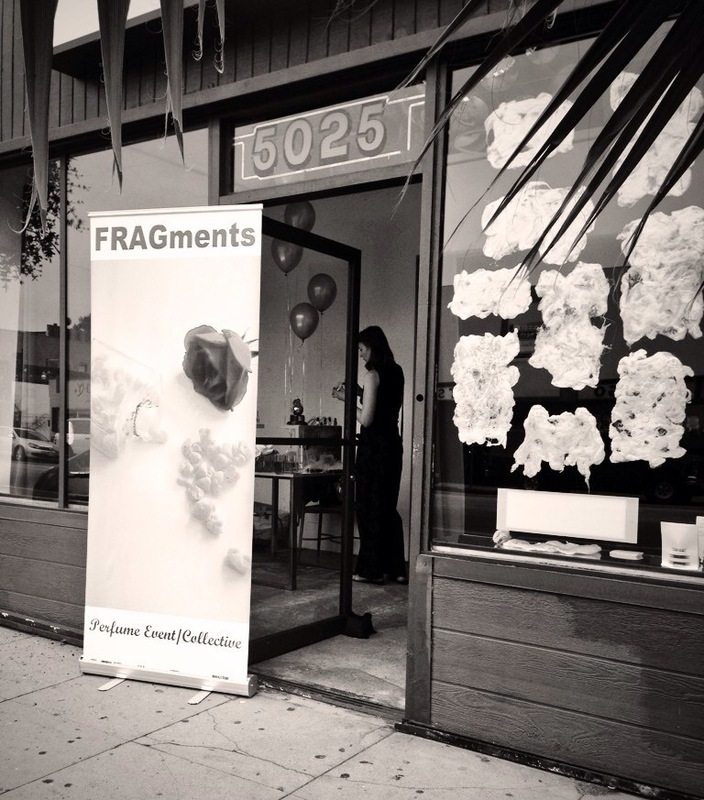 It was a sunny day in L.A. That warmth, however, wasn’t as pleasant as the kind atmosphere within FRAGments. 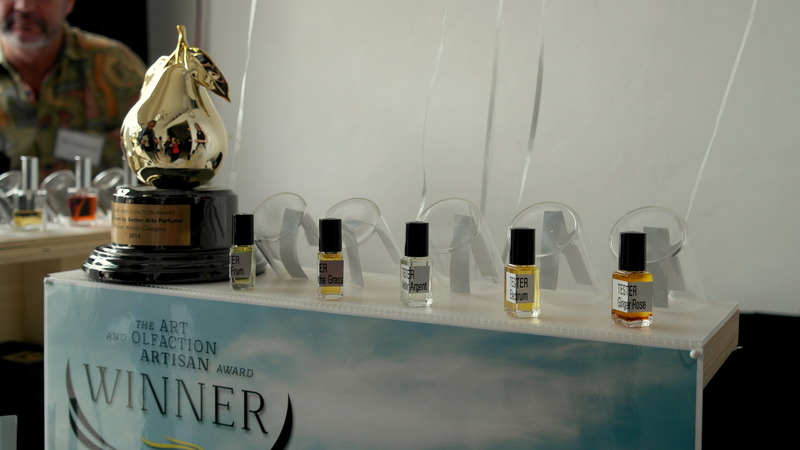 Perfumer Maggie Mahboubian (Parfums Lalun) imagined and brought it to life last year as a “curated perfume-as-art event”. 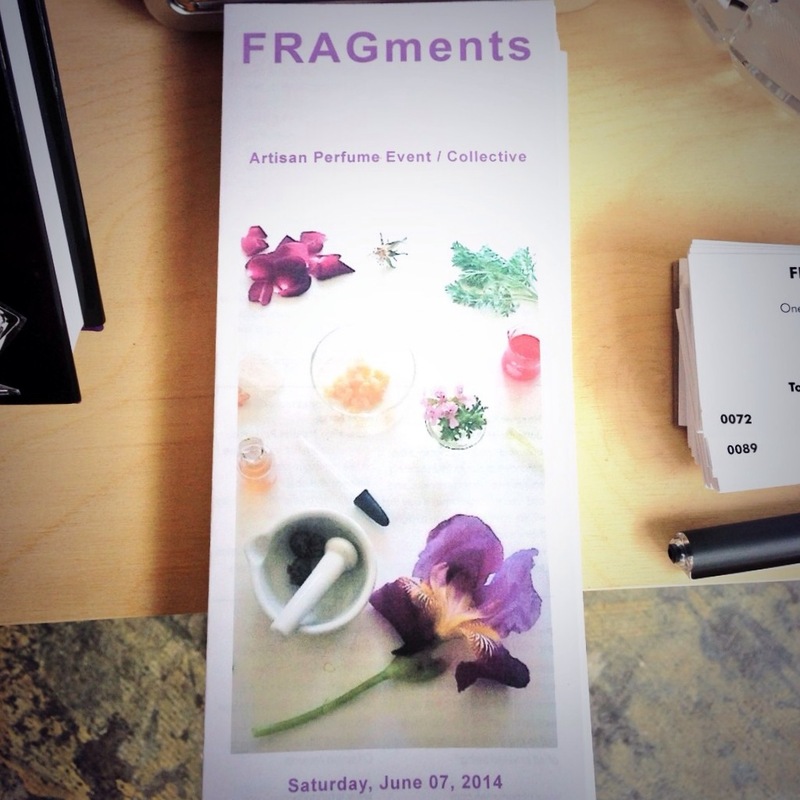 That very diffuse boundary (if anything like that exists) between Perfumery and Art is its uniqueness. 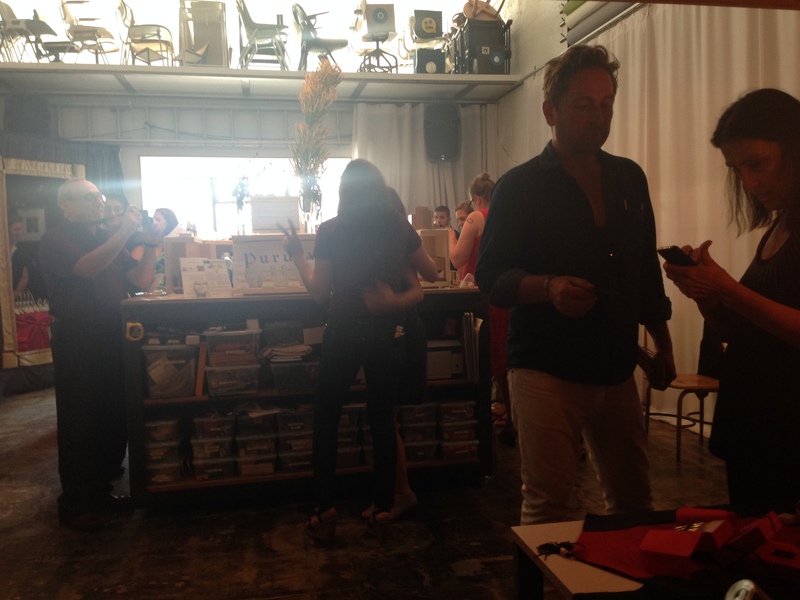 Attending the 2nd Annual on June 7th in Skinny Studio art gallery felt like visiting an old friend. The door was open so that everybody could feel free to enter and leave at any time. 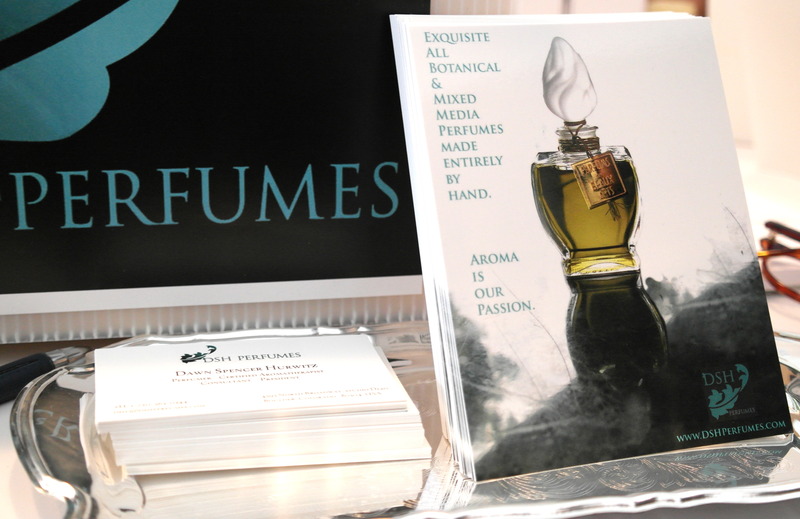 People were smiling, drinking, sniffing fragrances and chatting in every corner; perfumers and artists sharing their creations not only with visitors but also with their colleagues. 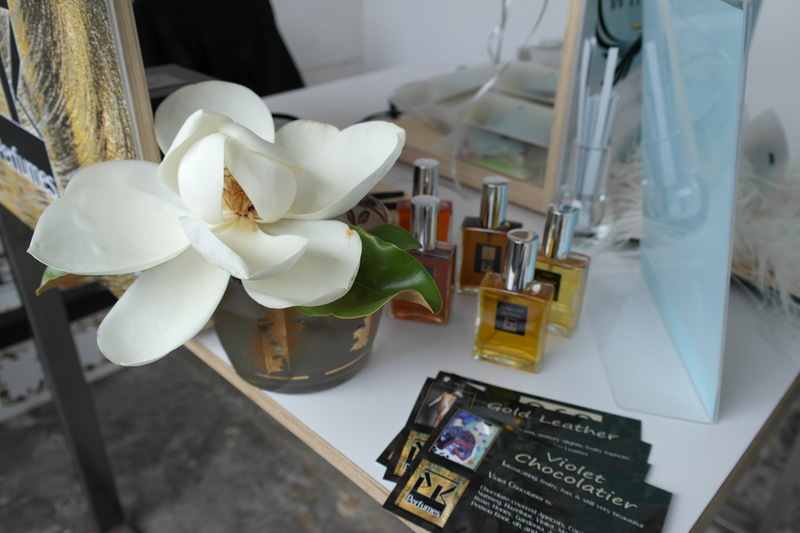 Dr. and perfumer (Olympic Orchids) Ellen Covey started the event with “Scent Perception”, a presentation about how our olfactory system works: there is no correct way to perceive scents because that perception is determined by our particular memories and previous olfactive experiences. Attendees were amazed at these facts and asked many questions at the end of her talk. Later I had the opportunity to meet Iris Moore. 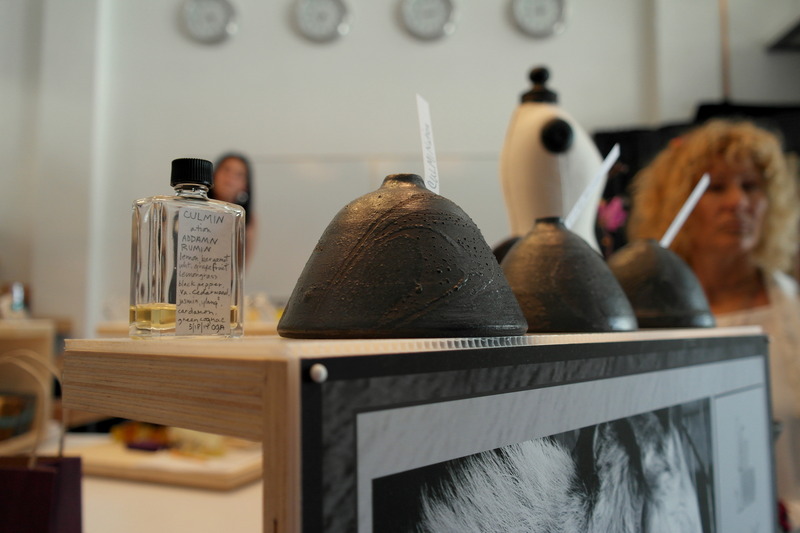 She is an artist experimenting with the sense of smell; her presentation of “Addam” was about the process of creating a fragrance based on the scent of a goat. I’ve also enjoyed talking with another artist, Daniel Krasofski. 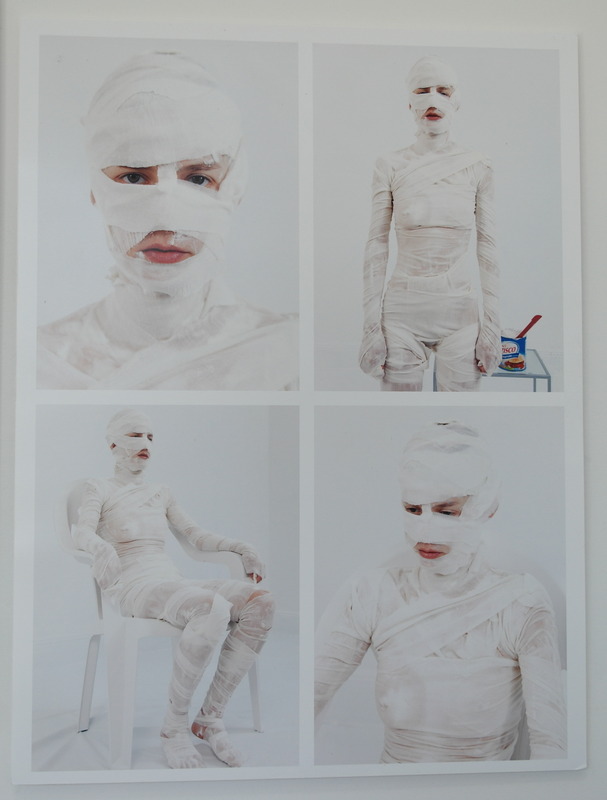 He made an installation (in which he took part) emulating a Renaissance painting. His work was about those fragrant ingredients worn by Catherine de Medici in perfumes and on leather gloves. 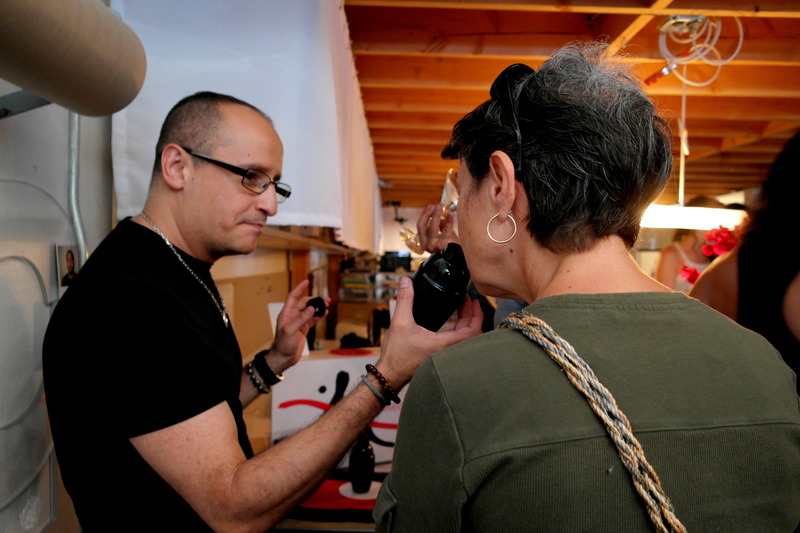 The Institute for Art and Olfaction (IAO) was present too. 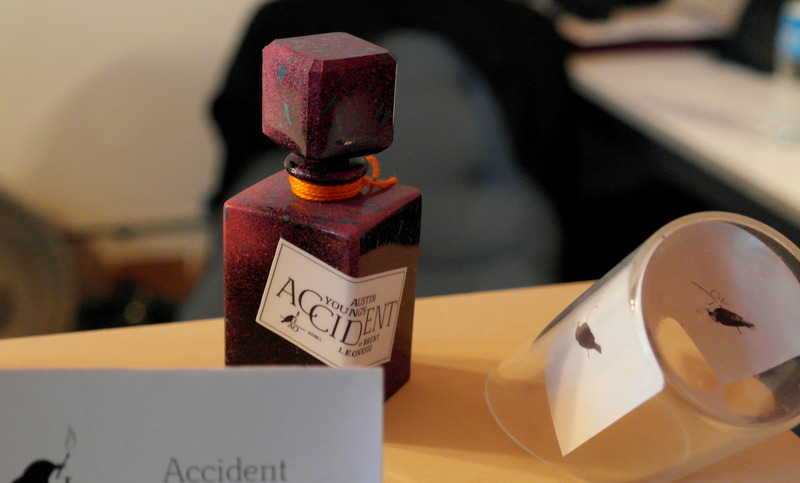 Saskia Wilson-Brown (founder) and Ashley Eden Kessler (perfumer) invited me to smell “Accident”: it’s an olfactive dimension of a cinematographic-like scene about a woman leaving her car after a crash. It smells like gasoline, make up, burning tires and perfume. 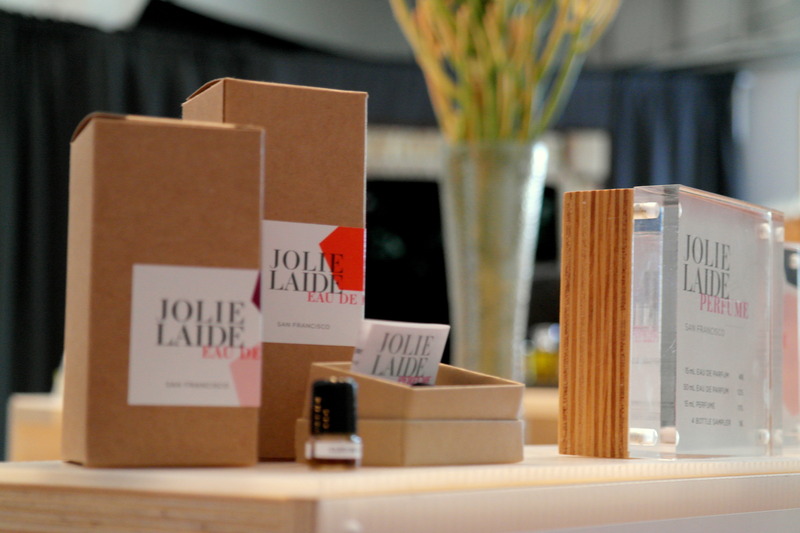 Juice and bottle were a collaboration between perfumer Brent Leonesio (Smell Bent) and artist Austin Young. 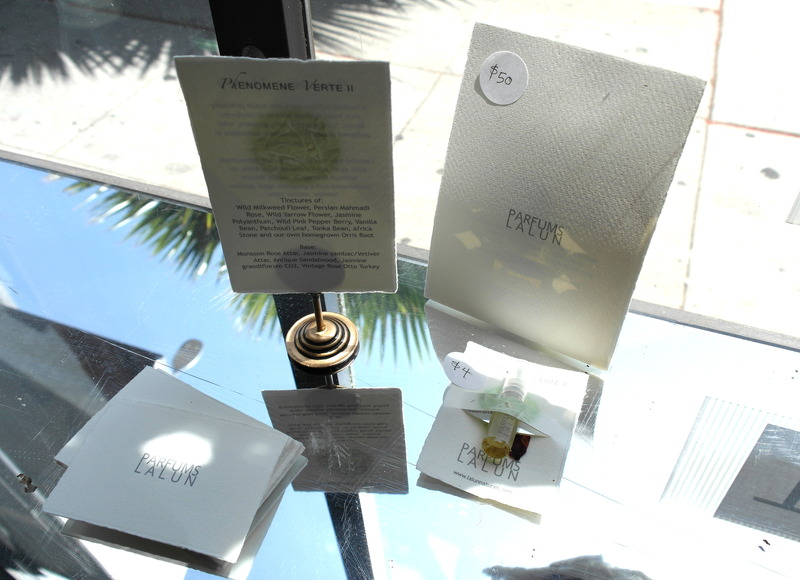 At the “front desk” of FRAGments the “Smell Me” exhibition -by artist Martynka Wawrzyniak– was displayed. 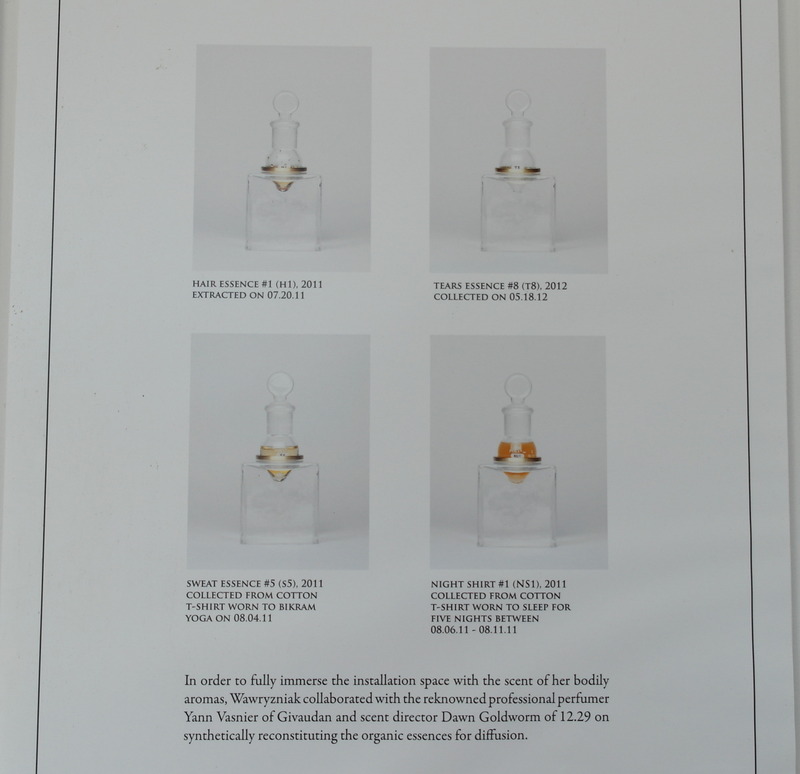 With synthetic ingredients (and the collaboration of perfumer Yann Vasnier of Givaudan) she presented reconstructions of organic bodily aromas. Their bottle design is amazing. Next to “Smell Me” was “Touch Me”, a tactile installation by Maggie Mahboubian. She also presented a new version of my favorite Lalun: Phenomene Verte II. 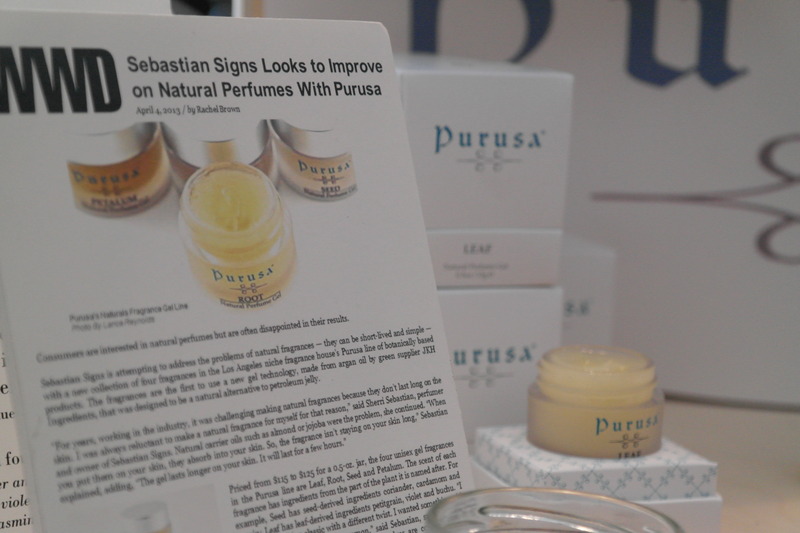 I was finally able to try the creations of Tania Reuben (Pure Natural Diva Botanicals), Dawn Spencer-Hurwitz (DSH Perfumes) and Amber Jobin (Aether Arts Perfume) and also had the chance of sampling the Purusa collection of Sebastian Signs. 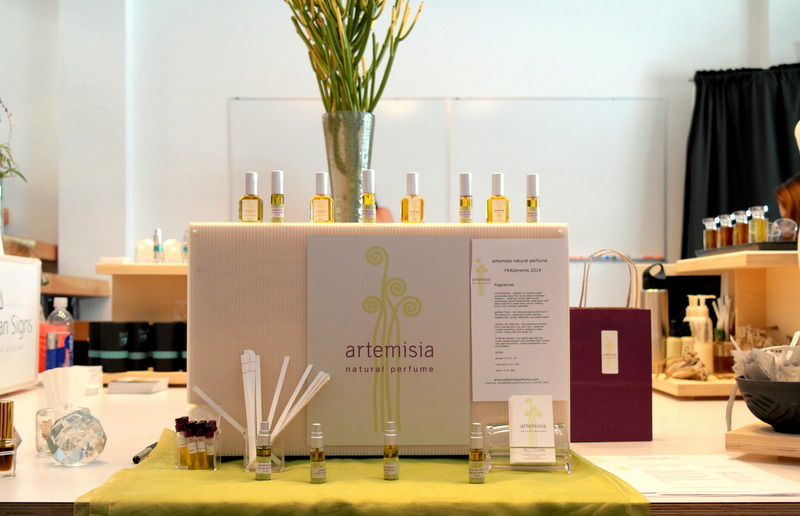 Perfumer Sherri Sebastian told me about her innovations using argan-based fragrance gels. 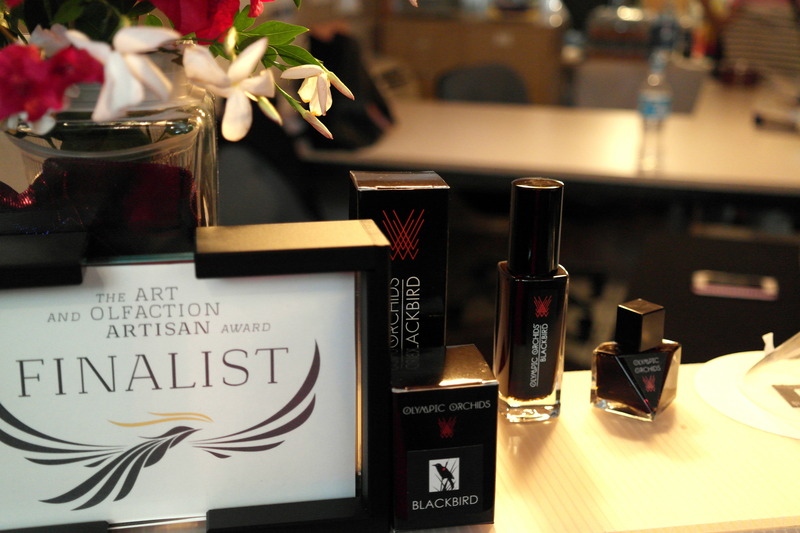 Irina Adam (Phoenix Botanicals) introduced me to her own brand and I greatly enjoyed the stories behind her perfumes. 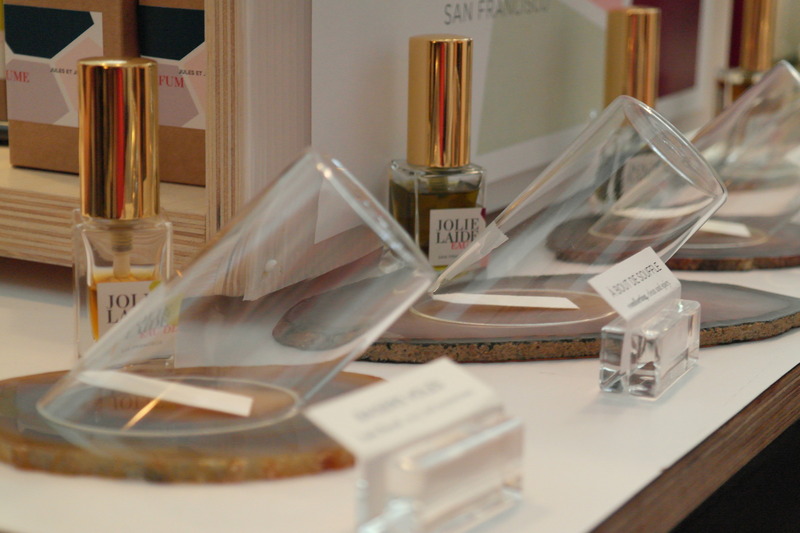 And it was so wonderful meeting again and talking with other friendly perfumers: not only Maggie and Ellen but Paul Kiler (PK Perfumes), Lisa Fong (Artemisia Natural Perfume), Mario T. Gomez (Mario Tomas) and Heather Kaufman (Jolie Laide) too. They were also taking part there and showing their respective most brand new compositions. It was an enormous pleasure to be able to attend. 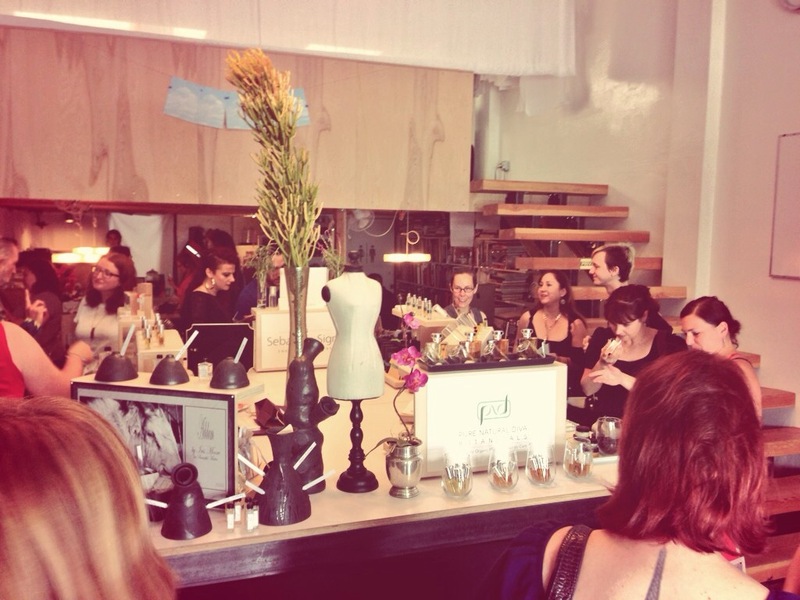 We are grateful for having been invited to this collective artisan perfume event. Nota bene: Due to space issues we couldn’t upload all the pictures here, so we invite you to check the whole album about FRAGments 2014 on our Facebook page. 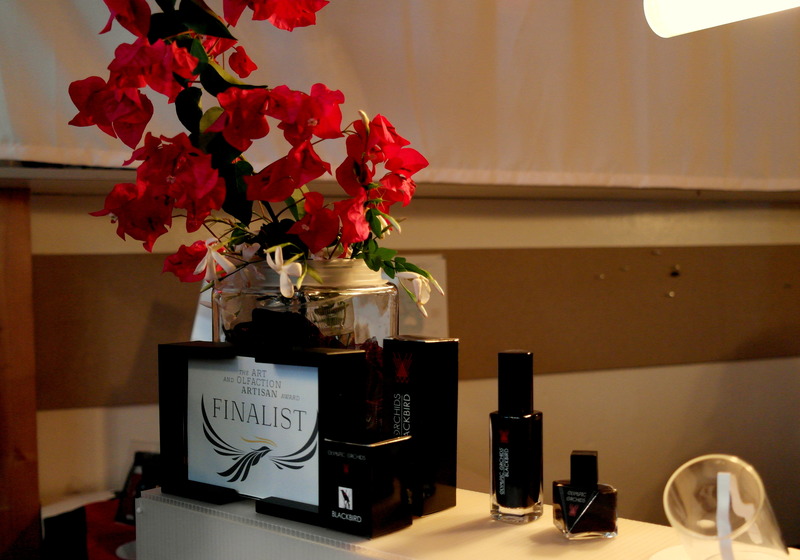 This entry was posted in Eventos - Events, Fotos - Pictures, Noticias - News, Perfumes, Viajes - Travels and tagged Aether Arts Perfume, Amber Jobin, Artemisia Natural Perfume, Ashley Eden Kessler, Austin Young, Brent Leonesio, Catalina de Médicis - Catherine de Medici, Daniel Krasofski, Dawn Spencer-Hurwitz, DSH Perfumes, Ellen Covey, FRAGments, Givaudan, Heather Kaufman, Institute for Art and Olfaction (IAO), Irina Adam, Iris Moore, Jolie Laide Perfume, Lisa Fong, Los Angeles, Maggie Mahboubian, Mario T. Gomez, Mario Tomas, Martynka Wawrzyniak, Olympic Orchids Artisan Perfumes, Parfums Lalun, Paul Kiler, Phoenix Botanicals, PK Perfumes, Pure Natural Diva Botanicals, Saskia Wilson-Brown, Sebastian Signs, Sherri Sebastian, Tania Reuben, Yann Vasnier. Bookmark the permalink. Beautiful! Thanks for covering the show! It was a delight chatting with you and trying your creations again.